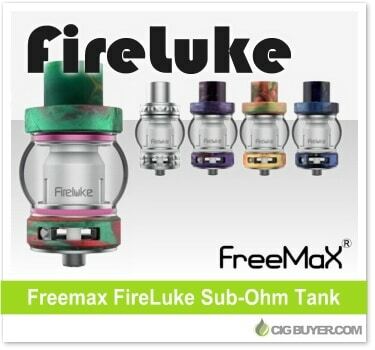 We haven’t heard much from Freemax in a while, but the new 25mm Freemax FireLuke Sub-Ohm Tank certainly sounds interesting. Available in stainless steel or various multi-colored resin finishes, the most unique feature is the bubbled glass tank section which can hold up to 5ml of juice. If you’d prefer a more compact look, it also comes with a straight glass tank that holds 4ml. The Freemax FireLuke Tank is top-filled with dual adjustable airflow on the base and is compatible with the new FireLock Coil Family. A 0.15 ohm sextuple coil is included (60 to 140W) and it also includes a stacked, two-post RTA deck for DIY’ers.